For two centuries Fidelio’s story of the power of love to fight tyranny and political oppression has inspired freedom fighters around the world. Beethoven’s music uniquely captures the essence of the indomitable human spirit at its most noble. 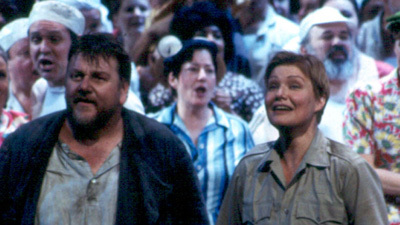 This cathartic performance, brilliantly led by Karl Böhm, brings together two legendary artists in their glorious prime: Jon Vickers as the unjustly imprisoned Florestan who is rescued by his faithful wife, Leonore, the great Birgit Nilsson in her very first performance of the role at the Met. Hermann Uhde is the malevolent Don Pizarro.